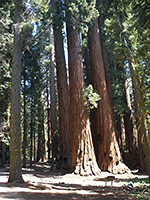 The largest and most famous trees in the Giant Forest area of Sequoia National Park are found along the 2 mile Congress Trail, an easy, paved loop running southwards from the most massive sequoia of all, General Sherman. Along the way are many more named sequoias, in small groups or standing alone, surrounded by a healthy mixture of other woodland on a hillside above Sherman Creek, quite close to the main road (the Generals Highway, CA 198), though the east part of the loop is far enough away to escape the noise of traffic. Various trails branch off in all directions allowing for longer loop hikes, especially south, into the heart of the Giant Forest. Although free of the permanent crowds in front of General Sherman, the Congress Trail is usually quite busy so this is not a hike for solitude, but the trail is still one of the highlights of the park. The round trip takes about one hour. For many years, the Congress Trail was accessed from a parking area alongside the highway, from where General Sherman was just a few minute's walk away, but in 2005 the pullout was deemed too small to cope with increased traffic so now visitors need to drive half a mile north, turn right along Wolverton Road then right again, on a short spur road to a large new parking area 0.4 miles north and 250 feet above the General. Part of the original parking lot along CA 198 is still available for disabled visitors, however, and a free shuttlebus is provided for anyone who can't make the journey - the path from the new carpark is quite steep, and very busy. 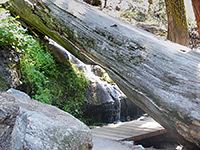 There are benches at intervals for those who need a rest, and a viewing area overlooking General Sherman near the end, shortly before a junction; the famous tree is a short distance west, while the Congress Trail begins straight on, and seems usually to be hiked in this (clockwise) direction. The Congress Trail soon crosses a little stream (an upper tributary of Sherman Creek) running underneath a huge fallen sequoia trunk, then reaches a junction with a half-way cut-off path, all the while passing plenty of medium-sized sequoia, but the biggest trees lie ahead. 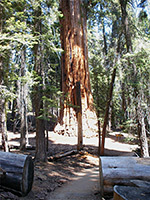 The route climbs gradually, staying close to but a little way above the return part of the loop, meets the Alta Trail (a long path between Giant Forest Village and Alta Peak), and arrives at the first named sequoias - President Tree (fourth largest in the world) and Chief Sequoyah Tree. 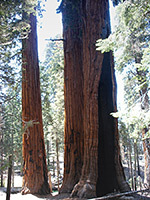 These are followed by the Senate - perhaps the best group in the grove, consisting of six giant, deep red-colored trees growing very close together, and then, after another junction with a path to Circle Meadow and the Huckleberry Trail, there is a second, similarly sized cluster (the Senate). Many of the oldest trees in this section of the forest are partially fire damaged, some missing a quarter or more of their width at the base, yet are still quite healthy. 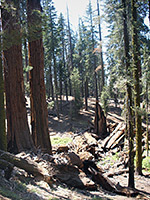 One further junction is with the Trail of the Sequoias, leading 2.5 miles to Crescent Meadow. Next is a short section shared with the Alta Trail, before the return (downhill) part of the Congress Trail forks off, next to the McKinley Tree. There is one more named sequoia past here, the fallen Telescope Tree, together with numerous other large and imposing specimens, and a second short tunnel under a fallen trunk. Vehicle noise can be heard as the highway is in some places just 200 feet away. The surrounding forest has the usual mix of large living trees, dead upright stumps, fallen trees in differing stages of decay, young sequoia, other conifer vegetation, ferns and lupines.